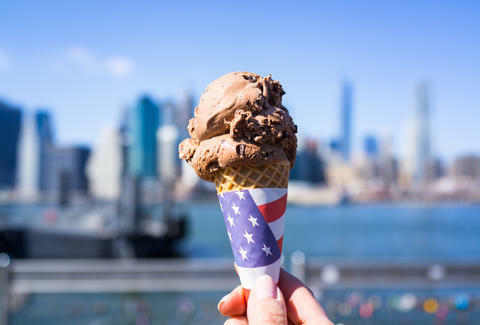 In case you needed another reason to eat obscene amounts of ice cream this summer, July 16 is National Ice Cream Day, and you know what that means: free ice cream, y'all. Joining a whole bunch of national chains, a slew of local vendors around the city (including a few or our faves) will be celebrating by doling out gratis scoops and running special promotions, so it may be wise to slip into a pair of drawstring shorts before you head out. The deal: Magnum's Meatpacking pop-up is offering a BOGO deal on their decadent customizable ice cream bars. Stop by and get two for the price of one when you check in on social media using the hashtag #MagnumNYC. The deal: For one hour only, you can score free ice cream in a Hong Kong-style egg waffle. After that, they're $5 for the rest of the day. The deal: Hit up the burger spot's Seventh Avenue location for a free mini cone of locally sourced vanilla or chocolate soft serve. The deal: Stop by the OddFellows carnival-themed pop-up next to Chefs Club Counter in Nolita for a chance to score a free cone of soft serve. They're giving away just 25 of 'em, so get there early. The deal: Visitors to Brooklyn's MOFAD get free cups of Häagen-Dazs while supplies last (you have to pay admission, though). The deal: Score a free 4-ounce cup of soft serve from any one of the DIY fro-yo spots when you show the cashier your 16 Handles app. You get your pick of Classic Vanilla, Dutch Chocolate, or the limited edition Strawberry Shortcake. The deal: Score a free frozen treat from Blue Bunny Ice Cream when you stop by their "Game of Cones" popup, which features a towering 7-foot 2-inch throne constructed entirely from ice cream cones where you can sit and snap a selfie. The deal: Friday through Monday at their flagship, you'll get a free pint of butter pecan when you spend $10 or more, and on Monday they're handing out free mini scoops to the first 100 customers. On Saturday from noon to 4pm, they'll be serving up samples outside the Whole Foods in Gowanus, and on Sunday, they'll be doing the same at the Tribeca location. On Sunday, they're also offering a "top-secret deal" at Whole Foods in Tribeca, which you'll have to ask the scoopers about. The deal: Get a free cone of vanilla soft serve at any Mickey D's when you download its app and redeem the Free Vanilla Cone offer, which automatically enters you into a giveaway sweepstakes to win free cones for life. The deal: The ice cream cake chain will give you a free cup or cone of vanilla, chocolate, or Oreo soft serve when you buy one. The deal: Stop in and get a free sample of the chain's new Mint Chocolate Chip Polar Pizza. The scoop purveyor also promises additional deals on National Ice Cream Day if you download its mobile app. The deal: All pints of Ben & Jerry's are two for $6, and there are also in-store "Sundae Funday" samplings throughout the day. The deal: Your dog can get in on ice cream treats, too. The pet retailer is handing out free Doggie Ice Cream Sundaes -- dog-safe vanilla ice cream topped with a dob biscuit sprinkle -- at its PetSmart PetsHotel locations nationwide. The deal: The LES ice cream shop teamed up with the real estate site Streeteasy on a new flavor they're calling Brownstone Crunch (it's salted chocolate pretzel ice cream with whipped cream, fudge and caramel), and anyone who donates $1 in-store to the charity Women In Need gets a free scoop. Shoot us a note at news@thrillist.com and let us know.